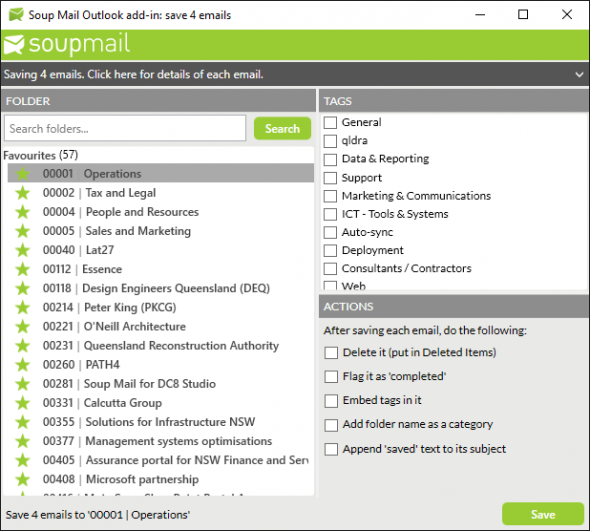 Over the next couple of weeks, we’re rolling out a major update to the Soup Mail Outlook add-in. We’re very excited about this, not least because we’ve given it a major makeover, but also because we’ve addressed several bugs and introduced some performance improvements. Fundamentally, the add-in works the same way as it always has. You send an email (or select emails in your mailbox and click the green “Save to Soup Mail” button), the prompt pops up and you click Save. Look-and-feel makeover: we’re now using a modern user interface, which is more aligned with the Soup Mail look-and-feel, whilst also working better on high-resolution devices, and adapting better to multi-screen setups. No more spontaneous logouts: a longstanding issue where you’d get logged-out of the Soup Mail add-in has been fixed – we’ve completely revised the way credentials are stored and maintained. Better visibility of emails you’re saving: the email(s) being saved are now easier to identify. Previously it could be hard to figure out which email was waiting to be saved in the popup; now they’re all listed with details right in the popup. Better “get help” experience: we’ve added a feature to the settings dialog that will automatically create a support request email if you need our help. This attaches the latest log file to the email. There are two significant new beta features in the updated add-in. You can enable them in the Settings form, in the “Beta features” tab. 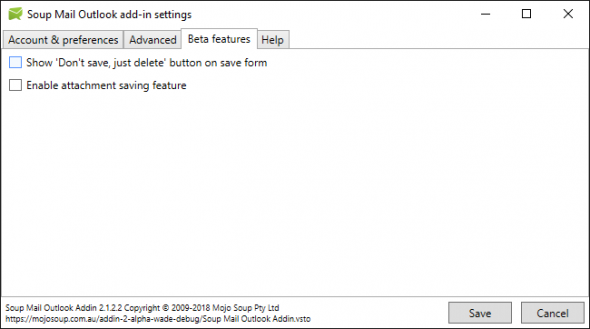 “Don’t save, just delete”: for sent items, this adds a new action button for emails that you don’t want to save to Soup Mail, but instead just want to delete from your Sent Items folder. This feature now enables you to do this straight from the pop-up. Save attachments locally: the idea of this feature is that you can configure the add-in to save attachments contained in the emails you’re saving, to a local/network drive in addition to saving the email to Soup Mail. What do I need to do to get the new version? An automatic update process will occur sometime in the next week or so which will apply the update for you. Once it does, you’ll need to log into the add-in using your Soup Mail login, confirm your preferences are as expected, and continue as normal. There are a few scenarios where you’ll need to manually switch to the new version, particularly if you’re using one of the alpha or beta versions currently. For more information, or if you just can’t wait for the automatic update, please see this help article. If your team is on Office 365 (or Exchange), you can configure a service account to handle Soup Mail mailbox sync on all your users’ behalf. Sync is already set up for your team members (including new starters). Nobody needs to do anything to get sync going! Users don’t need to provide their mailbox credentials for the sync connection. Users don’t need to remember to update their credentials when they change their Office 365 account password. Self-service archiving/folder downloading is here! 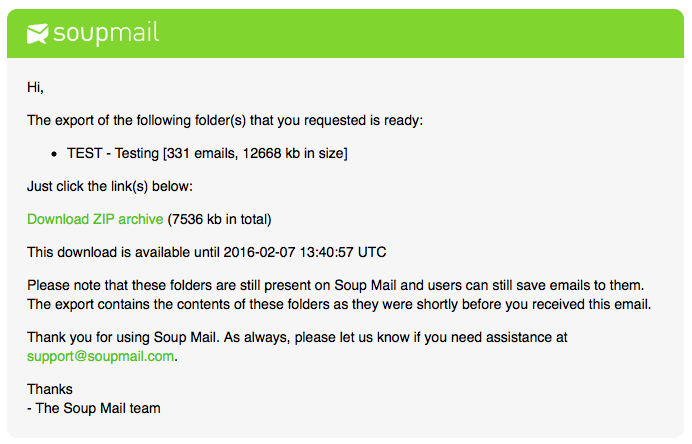 We’ve just added a much-requested feature to Soup Mail: self-service folder downloading. If you need to have offline copies of emails for your projects, for example when closing out projects and archiving all project documentation, this is for you. The archive will be prepared on our servers, and once it’s ready, you’ll receive an email that looks like this, and contains a link to download the archive to your computer. The contents of the archive is all the emails in the folder at the time the request is processed. If the folder is very large, the archive may be split into multiple downloads. If the folder is enormous, we might not be able to generate the archive. If this happens, you’ll get an email to that effect and you should contact support@soupmail.com and we’ll help you out. Emails are in the .eml format, which is able to be read by any email client. The files are named based on their internal Soup Mail ID. The archive also contains a ‘manifest’ comma-separated-value file, which lists the key details about each email (sender, recipients, subject, date) and will enable you to identify which file is which email. The folder and its emails remain in Soup Mail – you can keep on saving emails to the folder as normal. The folder’s status does not change (if you want it to, you should make the change). We’ve just deployed release 1.9. Folder creation hints: Have you ever gone to create a new folder, only to realise you don’t know what the latest reference number is? The new folder dialog now lets you know the reference number for the most recently created folder, so you can see it right there as you create the new one! The remainder of this release is server-side optimisations. We’ve deployed release 1.7.1 today. Perma-links for individual emails: Ever found an important email in Soup Mail, and want to be able to find it again without re-doing a search? Or found an email you were looking for, and want to help another Soup Mail user in your team find the same email? Emails now have a permanent url, so you can bookmark this url, or copy-and-paste it from the address bar of your browser, for example to send it to someone else. Note of course that the person you’re sharing a url with would need to be in your team and have appropriate permissions to see the email. Un-favouriting folders: Included in this release is a fix that addresses an issue where un-favourited sync folders weren’t being properly removed from users’ mailboxes. The remainder of the release is server-side optimisations, and some improvements to the experience for new Soup Mail users. In light of the notification on April 8 of the bug in OpenSSL, known as “Heartbleed“, we have joined nearly every other service provider on the internet in conducting a security audit and implementing precautionary measures. Soup Mail is no longer vulnerable to this bug. Whilst there is no evidence that any Soup Mail data has been impacted, there are some things that we are doing, and which you should do, to ensure that there is no residual exposure. Our servers were patched to remove any vulnerability at 16:44 on 08/04 (AEST). We have re-keyed and updated our SSL certificates. We will be forcing some logouts shortly, to eliminate the possibility that credentials obtained during the period of vulnerability could be used. The effect of this will be that you may be logged out of Soup Mail – in which case you simply need to log back in. If you use the Outlook Add-In, you’ll need to log back in within Outlook using the Add-In’s settings form, which you can access from the Soup Mail toolbar/ribbon within Outlook. We strongly recommend that you reset your Soup Mail password. Click the button below to do so. While you’re at it, ensure you are using strong passwords, and using different passwords for each web-based service that you use. Here’s a link to a resource that explains why. Check that your browser is configured to not accept revoked certificates. How to do this will depend on the browser you’re using, and you may need to restart your computer for the setting to take effect. Chrome: go to Settings and type “revocation” in the settings page search box, then ensure that the “Check for server certificate revocation” option is checked. Internet Explorer: go to Internet Options > Advanced Tab, and ensure “check for server certificate revocation” is checked. Then restart your computer. Firefox: go to Options > Options > Advanced > Certificates tab > Validation. 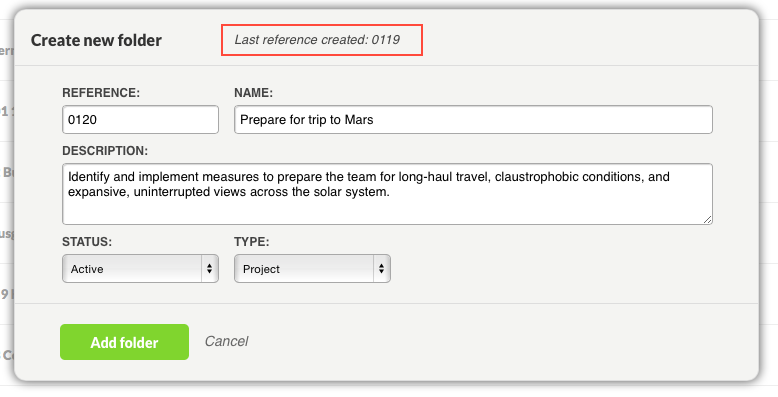 Ensure that the two options in the Validation dialog box are checked. Ensure that you are also taking appropriate measures for any other web-based services that you use, for example email, banking and social media sites. Please check our Twitter feed @SoupMail for updates. We’ve just released Soup Mail update 1.6. 31/01 13:30 AEST: A fix has now been deployed for the email download issue. Please report any further instances of downloading problems to us at support@soupmail.com. Most of the updates in 1.6 are behind-the-scenes optimisations, including infrastructure upgrades to improve our scalability and performance as we grow, along with a range of bug fixes. If you use filters when searching for emails, you might notice that the list of emails is now in alphabetical order. We’ve also fixed an issue that was causing errors to be incorrectly reported on the web app when creating a new folder. This week is “Clean out your inbox week” – the seventh year such a week has been observed. A sign of the times not only that clogged inboxes are so commonplace that people need to be rallied to clean them, but also that the task gets honoured with a whole week! 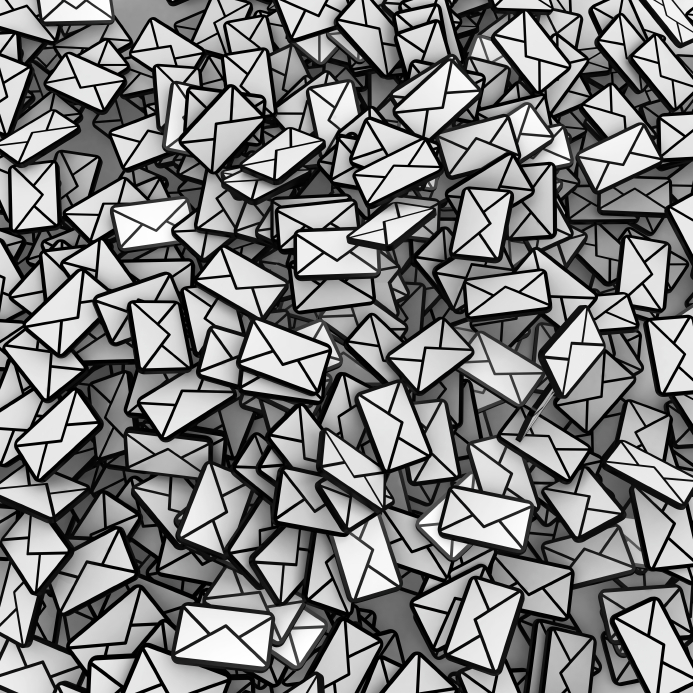 Not many people would argue that cleaning up their inbox is a good idea, and most would agree it’s a tough ask due to the sheer volume of email that arrives daily. The trickier question, which would probably leave most people wondering, is how exactly to clean inboxes out without losing important information that is likely to be needed some time in the future. Where should you put them – into an archive? into a hierarchy of folders within your mailbox? into the file system somewhere? It’s easy to frame this as a question for individuals, and answer it in terms of what works best for the user when it comes to retrieving the emails. But in an organisational context, there must be a better approach. Emails, after all, are the bread-and-butter of interactions between an organisation and its customers, suppliers, and other partners. They contain key information relating to agreements, commitments, clarifications, and decisions – and this information belongs to the organisation. Shouldn’t it be accessible to team members so it can be discovered, reviewed, checked, and actioned? Shouldn’t it be searchable, so that anyone working on a particular project can retrieve any email relevant to the project? Is this what your inbox feels like? We’ve designed Soup Mail to achieve exactly these things. Soup Mail provides a common repository where people can save emails to team folders, outside of their inbox. So you can have it all: a clean inbox, and easy searchable access to the emails – not only those you were party to, but the full history of emails for each project. Check us out, and sign up for a free trial account, at www.soupmail.com. Firstly, our apologies to the users who were affected by the processing delay today. What was scheduled to be a routine maintenance release turned out to coincide with the spawning of thousands of surplus background jobs which were holding up the email processing queue. This resulted in it taking longer than usual for emails to be visible in Soup Mail. Fortunately the release today has addressed those issues and normal operation has been restored and improved. We recently updated the Soup Mail iPhone app to align the styling with iOS 7 and ever since we just haven’t been able to look back. Therefore, with today’s release we have overhauled the styling of the Soup Mail web interface and replaced all the icons and buttons with their metro-ised equivalents. It has been a subtle change in some respects, but sometimes those are the best kind of changes. With this release we have implemented a number of new features and infrastructure upgrades to better support the needs of our large enterprise and government customers. While not yet exposed in the interface the foundation is now in place for improved enterprise administration of Soup Mail.